I wrote Mastering Pretty Permalinks in WordPress with the intention to introduce the concept of the best permalink structure for WordPress powered websites. This was a call to try to encourage people to organize their website, but beware of how the permalink structure might be overrode if you have a file folder name the same as a post and you are using the post name permalink structure. It is obvious that I am going to say that the post name (formerly known as pretty permalink) structure or the /%postname%/ option in your WordPress Permalink General settings is the best structure. However, I am going to go a step further. Search Engine Optimization is fun to play with in regards to your domain’s URL structure. It can be a way to optimize what your article is, other than just organization. We can control how our permalink structure can look whether by post ID, month and date and more. We can even designate tags and categories to these posts and call them to pages using custom WordPress queries. For example you can call a category and show only tags and a certain number of many posts. The reason why the post name structure (/%postname%/) works best for a post is because it shows the post title closest to the domain, showing how important it is to the site. The structure within the web page itself will also emphasize this using heading tags (h1, h2, h3, h4, and so on.) Now, if you listed by category (and I have seen people recommend that), depending on how your category is labeled, you are telling the search engine that the category is far more important to crawl than the actual title of the post. WordPress naturally has the base “category” as a name and you can group posts under those categories. 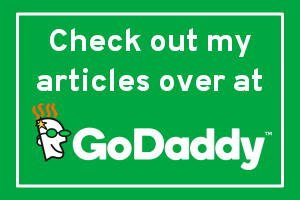 It is okay to display your posts on your site in a category. Most people believe including categories makes your posts duplicate content. NO! It is only if you are posting the same thing again on your site or the same exact thing on another site (like if you do guest blogging.) The search engines are not dumb. Now, here is the fun part as well as the tricky part. What if you do use the category structure? How can you make it clever enough to draw more attention to your title. WPCandy actually exercises this clever way by naming the category’s slug an action. Yes, just the slug as you can designate a different name pointing to a different slug. Pretty cool, huh? As a note, the posts do group under the general “category/category-name”. Pages are kind of fun and since WordPress 3.0’s menu addition, your control over pages has increased with several options. You can use the older hierarchy structure with parent and child pages. Remember, pages in WordPress are normally known for being used for static content. The older hierarchy structure adds the slug of the parent page into the URL structure. SO, if you have like a parent page and then three deep into children and grandchildren, your URL structure might get a bit long. That might not be a good idea for search engine optimizing as it takes away the importance of that page. However, the hierarchy structure is not the only way. You can use the WordPress menu option in your WordPress administration (Under Appearance>Menus) to organize your website and keep your URL structure for your pages simple. You can publish a page without using the hierarchy and use the WordPress 3.0 menu to organize your website without adding more length to your page’s URL structure. Now, both methods can be used and Google will pick up and group areas of your site that have been optimized as a group. 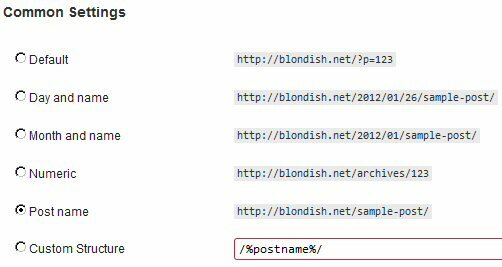 For example, if you have defined that your main sections of your website are your ‘About’, ‘Contact’, and maybe… as an example say ‘Resources’, like I have here in Blondish.net, Google will pick up that structure if you do have a set up pages that are relevant to that main area. As a note, We can also apply these techniques to custom posts types since WordPress 3.0. Your permalink structure is both a way to organize and help search engines, but can also be great in helping your visitors navigate your website. The best permalink structure to use in WordPress is one that is the most coherent for search engines to deliver the best results to potential visitors. Play around with your site and see what is best for you. Thanks for the detailed tutorial on how to do this. However, I guess its not advised to change the permalink if you are a seasoned blogger. Previous time there was not option for placing post name. that time i was using /%postname% in the custom field. Thanks you for things to think about. Granted… I have not refreshed my SEO knowledge in the last couple of years…..
Can you give me a source on having the post name being closer to the domain name adding weight? but isn’t it better to stick more keywords into it… maybe “helps-teach”? I think that is the way I am going to go for SEO. Permalink structure does affect your traffic and seo because you can look at the link an know what is about so you are more likely to click it. Very good post, how do you plan on using google+? Yeah, no “/” at the end. I use the postname structure and it seems to work out great for me. Permalinks play a HUGE part in seo. Nile, thanks for the extensive tutorial. It took me a while to learn this, and I’m sure it’s made a big difference. The other reason that the post title is best, excluding the date and time, is that it makes your content evergreen. In other words, someone can come back to this post years later and still find it timely. I agree with you. I’ve been using the post name structure since the beginning since it is quite tidy and easy to remember. You can also see clearly the structure of your wordpress with this since you are free to put whatever you want that makes it easy to remember for you. WordPress blog is interesting. To be honest it took me a long time to understand the tutorial because the concept of using permalink structure in WP blogs is new to me. I completely agree with Steve regarding writing evergreen content. I always use the “post name” option as the permalink structure on both blog posts and pages. 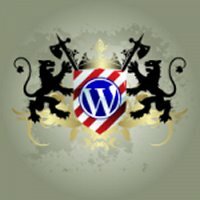 I was new to WordPress and I discovered that few weeks ago. Thanks nile, this perhaps is applicable to newly up wordpress site. I think for those maybe year old blogs it would be hard for them since they already establish backlinks, PR and the like with each post they have. Nonetheless this is still very informative post. Thanks Nile for this aarticle. Permalink concept is little bit confusing but after reading this post is quite good to deal with it. I agree Nile. Most of my newer sites using the %postname% permalink structure. I do wish though that was a way for me to change the permalink structure of an already established site, without loosing any “juice” and all that suff. Hey I don’t know how it really effects seo but if one uses the post id permalink, it appears a bit complex to the visitors and can make it difficult for them relate to the post if they are search engine visitors. Hey thanks for the article I have been using /post title permalink and it has been working fine for me. I looked at your graphic above and see how you use postname. Is it the same if I use custom and use just the postname. Seems like the same result happens but somehow when I first began changing the permalink structure away from default, I began using custom. Anything is better for good SEO compared to using the default setting. I used to do this before when I was blogging in a wordpress blog before. This one is a helpful tip and it really helps my blog on having search engine traffic. Content is evergreen!! Thanks for the post!! Right now I use categories before the name of the post but I would like to change it. The only fear I have about changing it is if it will change every url of my old pages (and lose the backlinks that I have, cause of broken links). Can you tell me if this will happen or if I can change only the url structure of the new posts without changing the old urls? Wow, I had no idea, but I am new at all of this and trying to learn as I go. Thank you for the information. Great post. Thanks for sharing your insights. Great post and very good see see someone go into such depth. I have played with permalinks before this but hadn’t realised there were so many great ways to manipulate them. Really nice information, it´s a pleasure to read your blog. Thanks for sharing and continue on this way! Not something I had ever considered, thanks for the advice. I am not sure many others would have thought about this much either. I totally agree that the post-name is the best way to go. I helps your SEO efforts tremendously. 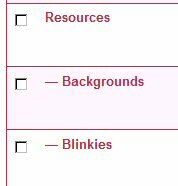 I didn’t even know that was an option for your permalinks for so long. I felt so dumb when I finally found out you could change it. I wish I had found your article when I first started using wordpress! You make a whole lot of sense and beginners can get stuck right in without having to do what some of us did but trial and error. Your Permalink Structure For WordPress is right on the money! i was committing blunders in using permalink structure before… only sometime back i realized the right way…. i use %postname% structure…. The permalink structure is integral to establishing a coherent “presentation” of your content for both users and bots, Nile. You’ve given us excellent tips here to maximize the structure in a way that best shows off our form and substance. Thanks for the detailed tutorial on how to do this. Did not know how to change it till now. what a amazing article u’ve written on this topic! I just loved your post & will visit this blog soon..
You provided a good explanation on how important permalinks are. This tutorial is just what I need to explore and perform some adjustments in my site. Doing this right you will be beneficial to me and my visitors. Permalink always provides search engine friendly URL and those are good for SEO. It will have a positive effect on your website ad will surely boost the SERP as Search engines like Google, Bing love the URL representation. Perfect tutorial! And it is even more useful because to know permalink structure of the blog is a must for a good blogger. What you have share in this post is so important. I am shocked at how many people use the default setting (i.e. p-233). You gain nothing from this structure! I am so glad that someone taught me this very early on. I’m not sure if this Permalink structure is really the best. When you use /%category%/%postname%/ SE’s and web browser would treat it as a directory rather than a page. In my opinion Google gives more priority to a content rich “page” than a directory. The page loads slowly on older browser when you use directory structure! Instead if you use /%category%/%postname%.html the browser will request the exact page. One more point; if your domain name contains your main keyword then there is no need to add /%category%/ to your URL. The domain name, directory name and URL will have your keywords…so it might look like over optimization for Google. One of my sites got penalized by Google after I changed my Permalink! Sadie here in France …C’est fantastique this post! I’ve added a link sharing it on my site today most people don’t realize just how important search engine friendly, easily crawlable permalinks are to website success. They will after reading this nice work! Thanks for educating me. I’m really trying to do things myself and this has helped me a lot. Liked the post.. Nice issue presented. Go ahead!! Is there anything that can redirect regular string stucture to the new permalink? I am already interested in WP blog.and familiar with permanlinks interested that you can add your post name. i haven’t found any permalinks there ur may be right for that! Thanks for the suggestions on using the best permalink structure, though I needed to read your article twice before I could fully understand everything as I am not that technical when it comes to managing my posts. I will keep your suggestions in mind and will try it out on my next post. Thank you! Well described,This will helpful for individual pages names.I dont know how to handle.Now I got your point of view. your have made it more clear even for me. I have not given this much thought in my setups. Yet, with my sites this is a must. My blog has been more active and this information is a helpful procedure in getting the most out of all the fun and amazing things one can do with WordPress. It use to be to difficult in getting others to understand what even a permalink is. Now, you have a method that I can bring others to and be successful in following your gifted presentation. Doing it right the first time spares so many problems down the line. Nile, your one of our greatest tech supporters and leaders in the industry. I look forward in your next tutorial knowing all the years of knowledge will be priceless. I do appreciate your talents as others are sure to prosper off them as well. You simply remarkable! Thanks for the detailed tutorial. Thankyou so much to share this informative post, about the best permalink structure to use wp. I was playing with pretty permalinks on my site. Luck I was doing it on my xampp, first time it took even on local server some time to work properly. Almoast had a hearth attack when suddenly links to my custom taxonomies stoped wroking. Important information related to Permalink Structure for Posts. New info for me that post name that is more closest to the domain shows this post is very important to the site. Thank you for sharing this article…Very useful to me… Is it the same if I use custom and use just the postname. I use /%postname%/ for my website, and it seems to work well. Very good and informative article, though. well supportive for me.permalinks description also good and also your explanation too short bt really helpfull. Thank you very much for a wonderful and informative post. I found it to be very useful. I’ve decided to opt for the category/postname approach myself.